Welding, polishing and sand blasting were among the daily activities for a group of young women during a recent work placement at Hamilton-based manufacturer, Longveld. The placement is part of a unique training course offered by Wintec and Longveld, aimed at getting more women into engineering. Sixteen young women from Waikato secondary schools are enrolled in the programme, which is in its first year. They visit Wintec’s workshop one day a week, where they train in fabrication and engineering while gaining credits towards NCEA Level 2. They then spend one week at Longveld working alongside staff, rotating between activities including stainless steel sheet metal fabrication, waterjet profile cutting, welding, grinding, sand blasting and computer-aided (CAD) design. As part of their activities, they produced name plates and miniature stainless steel house frames. This, along with the rotation system gave them a chance to experience first-hand what it means to work on individual manufacturing and fabrication components that would ultimately contribute to the creation of a larger project such as a milk tanker, farm vat or dairy factory. Shawnee Dixon from Hamilton’s Fraser High School says: “It was a great experience, with friendly staff at Longveld who taught us a lot and were always there to help. It was a really good opportunity and a great experience”. Wintec youth pathways manager, Johnny Gordon, says the course is a good way of encouraging women into what is traditionally seen as a male-oriented industry. “The programme provides the opportunity for women to learn in an environment where they’re not the only female in the room,” he says. 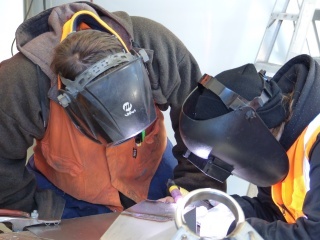 “The partnership with Longveld is exciting for the Waikato Trades Academy because it means we now have the connection between secondary, tertiary and industry,” says Gordon. The students are in two groups for the work placement section of the programme, with the second group set to complete their Longveld placement in September. The programme is part of Wintec’s Waikato Trades Academy, a Government-led initiative, free to students, which sees Wintec partner with Waikato secondary schools to encourage students to stay in school for longer by engaging them in hands-on learning. Any young women interested in joining this programme for 2016 can contact Wintec’s youth pathways coordinator, Vicky McKinnon on 07 834 8800 extension 3123 or Vicky.mckinnon@wintec.ac.nz.